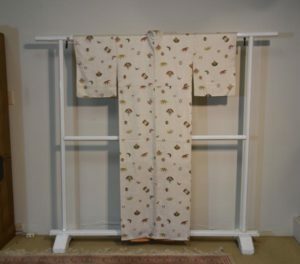 A gorgeous soft silk Kimono with a rice paste resist design of traditional Japanese flowers. In good condition. 1220 mm’s across and 1500 mm’s long. SKU: 13673. Categories: Kimono, New Arrivals, Textiles.